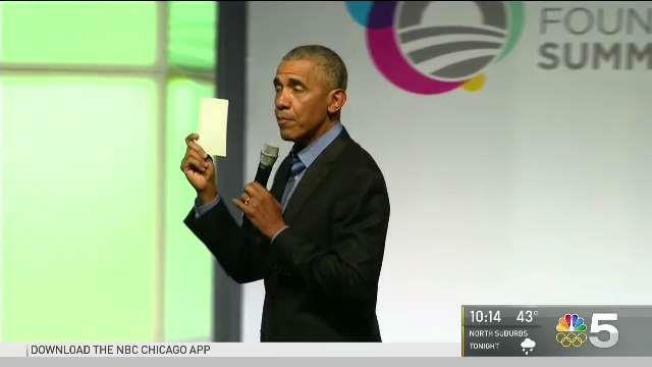 The inaugural, two-day Obama Foundation Summit wrapped up Wednesday night inside Chicago's new Wintrust Arena in the South Loop, with 500 people coming from 60 countries to be inspired to make positive changes in their communities. "If nothing else, take from this summit the sense that you are able to transform the world," former President Barack Obama told the audience. Obama told the crowd to believe in themselves but limit their time online. "Constantly checking, seeing what’s next, it’s tough to sustain things," he cautioned. The grand finale of the summit included music from Chicago natives Common and Chance the Rapper. Gloria Estefan and "Hamilton" creator Lin-Manuel Miranda also made appearances. Miranda spoke on the continuing crisis in Puerto Rico and shared the stage with Common. Former first lady Michelle Obama warned against over-sharing on social media. "You don't tweet every thought,“ she said, explaining that "first initial thoughts are not worthy of the light of day." However, she clarified that she wasn't "talking about anybody in particular." Michelle Obama also gave advice on raising daughters and sexual harassment. "If we don't teach our young girls to speak at an early age, that doesn't just happen, it takes practice to have a voice," she said. Former Vice President Joe Biden came to Chicago as well to encourage people to speak up against neo-Nazis who marched in Charlottesville. "The same anti-semetic bile that brought down Europe ... silence is complicity," he said. Sharing these ideas with others is the goal of the Obama Summit. "Let's get to work," Barack Obama said before leaving the stage. Obama added that "this is just the beginning," but there were no official announcements of future summits.